If you work in a public library, you’re probably familiar with statistics about how many children in your service area qualify for free and reduced-price meals at your area schools. Nationwide, that number is around 21.5 million children*. But what happens in the summer, when the majority of children aren’t going to the school where they receive this lunch? According to data gathered by Feeding America*, as many as 18.8 million of those children do not have access to nutritional support during the summer. In many cases, that means these children are at high risk for food insecurity and missing meals altogether. Libraries are increasingly stepping in to combat summer food insecurity in their communities. Many libraries work with established organizations to serve as a summer lunch site–an approved site for distributing nutritional meals to youth during the summer. Different libraries have aimed to adopt this approach in ways that meet the needs of their community and are viable for the library. At Skokie Public Library, for example, free summer lunches are served Monday through Friday from 12-1 p.m. to any youth age 18 and under on a first-come, first-served basis. Distribution happens in our High School Lounge, and youth participating in the program eat either in that space or the outdoor courtyard adjacent to it. Meals are provided by the Greater Chicago Food Depository, who also provide training and ongoing support. For information on acting as a summer food service site, take a look at the hugely informative toolkit from the USDA. 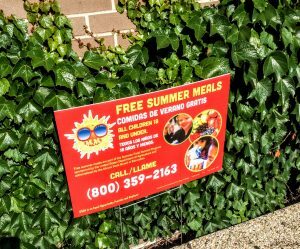 Some libraries may be interested in combatting summer food insecurity but are unable to work with a summer lunch organization due to issues of location, health code, or library policy. A number of these libraries look for alternative methods of serving their patrons. At some, local groceries stores donate gift cards to the library, which are then used to purchase pre-packaged healthy snacks than can be distributed at programs and to youth who spend entire summer days at the library. Other libraries look to support existing summer lunch programs in their communities by offering adjacent programming. These examples indicate that libraries across the country are thinking critically about how to support members of their community who may be experiencing food insecurity over the summer. How do you combat summer food insecurity at your library? Amy Koester, Youth & Family Program Supervisor at Skokie (IL) Public Library, is writing this post for the Public Awareness Committee. She can be reached at amy.e.koester@gmail.com. I wanted to share the website toolkit http://lunchatthelibrary.org/ as a resource for everyone. While specific to CA, much of the basic infrastructure, tools and tips, and advocacy for laying the groundwork with administration should be translatable. In Oakland, we find that summer lunch firmly supports our mission and goals, and we consider it an essential service of the library. Thanks a lot for sharing. I did not know about combatting summer food insecurity in the library but now, thanks to your writing I do and I must say that finding out new things is always welcome. Feel free to share with more if anything.